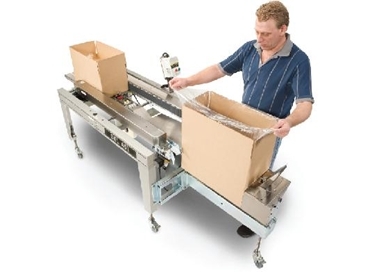 Available from Live Industrial , the BEL 451 semi-automatic poly bag inserters manufactured by Wexxar Packaging Inc. are designed to insert poly bags into RSC cases, providing a cost-effective alternative to manually inserting poly bag liners into corrugated cases for bulk filling. The BEL 451 features a vacuum system that draws the poly liner into all four corners of the box flush against the sides. Case filling can be controlled manually or regulated with the optional programmable weigh scale, which can be interfaced with a variety of filling machines such as auger and hopper fillers or belt type feeders. The BEL 451 poly bag inserters automate manual bulk filling and sealing lines at a reasonable cost while improving overall efficiencies and enabling ergonomic safety for operating personnel.